The Gilahina Trestle is now listed on the National Historic Register, which means it’ll probably come in for some funding to repair/restore it. 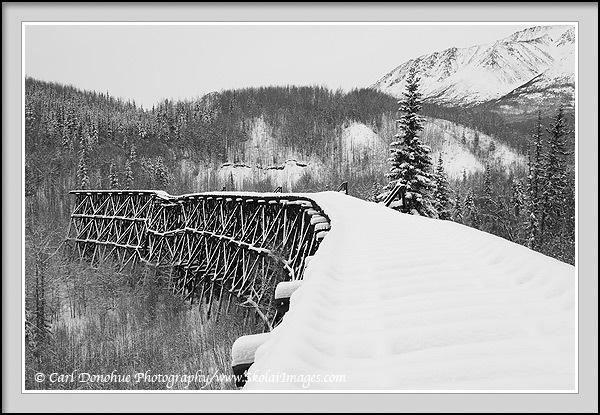 Because the trestle sits right beside where the McCarthy Road currently runs, it’s become a significant vista for most visitors to Wrangell – St. Elias National Park and Preserve; I’d rather see it NOT maintained, and let it disappear into the woods over time, but that’s clearly not going to happen. The National Park Service is all about funding for construction projects, so the Gilahina Trestle will probably be the recipient of some cash. I suppose I should point out that the Bridge is not technically Alaska’s famed ‘Bridge to Nowhere’, but the nomenclature seems to fit rightly enough. 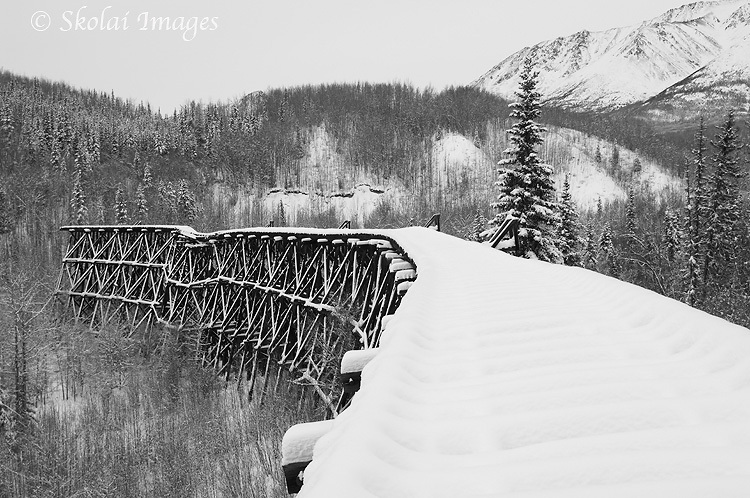 Perhaps that’s reason enough for some funding, restore the west end of the bridge, and the Gilahina Trestle can be known as Alaska’s Bridge to Somwhere – namely, the other side of the Gilahina River. In the meantime, ‘Bridge to Nowhere’ works for me. As a side note, you might notice that many of the rivers in the Wrangell – St. Elias region seem to end with the sound ‘na’ – Chitina river, Kuskulana river, Nazina river, Tana river, etc, are a few I’ve mentioned on this blog before. Well, the people indigenous to the area, the Ahtna, spoke/speak Athabascan (often also written or pronounced Athapaskan, either is suitably correct, I’m told), and the English word ‘river’ translates to Athabascan as ‘na’. This is all very cool, but it means calling the watercourse the ‘Gilahina river’ actually translates as ‘Gilahi river river’. There is a lot of snow out there already, or is this from last year? It is showing the years isn’t it. Yeah, this was taken last week. They have a bunch of snow out at McCarthy already, like a foot and a half or so I think. The one section to the left looks like it is about to fall down already. Yeah – that section is actually pretty badly collapsing on the right – it’s all tilted and askew.